The Safety Centre are specialists in fire safety products. We have a wide selection of fire alarm batteries available to buy online. Our selection can be used in fire alarm system control panels to provide a standby power source in the event of a mains failure. For more information on fire alarm batteries call us NOW on 01200 428 410. The batteries we have on offer are available in various sizes depending on the type of fire alarm system that you have. Our battery range features batteries from 0.8Ah in size all the way up to 100Ah sized batteries. Most fire alarm systems have a 24V operating voltage which means that two 12V batteries are normally connected together to provide a 24V power source. Whereas security systems more commonly have a 12 volt operating voltage. Yuasa are the worlds leading manufacturer of sealed lead acid batteries. These units are ideal for standby use in fire alarm systems. They have the NP and Yucel range of batteries available, with both being suitable for use in fire systems. Yuasa have a well earned reputation from manufacturing a high quality product, they are available on our webshop at fantastic prices. Along with Yuasa Enersys are also featured here. 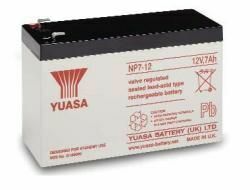 Like Yuasa Enersys also manufacture an NP range of 12V batteries which are suitable for use within control panels. The small batteries feature a slide on spade type terminal whereas the larger units have a screw-in type terminal which provides a robust and secure method of connecting the leads into the panel. Powersonic also manufacture a high quality product and have the distinctive blue and grey styling. These are available in a variety of sizes and are ideal for fire and security system use. If you’re interested in these products you may also be interested in our 7Ah Battery and C-Tec BF375PEK products.